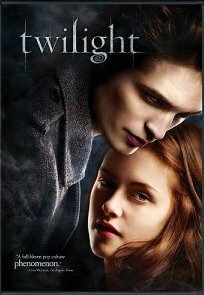 “Twilight”, an eerie love story based on the bestselling novels by Stephanie Meyer, is a captivating film that draws in its audience from the very beginning. The movie follows the story of Bella Swann (Kristen Stewart) after moving from sunny Arizona to the miserable little town of Forks to live with her dad, Charlie. She expects next to nothing from the move, save for same, gut-wrenching disappointment that caused her mother to leave Charlie seventeen years ago. All that changes on her first day of school, when she meets Edward (Robert Pattinson), her impossibly handsome lab partner who's hiding a terrifying secret: He's not entirely…human. By the time Bella realizes this, she's already fallen hard for the vamp, giving the story a modern twist on the forbidden romance of Romeo and Juliet. Co-stars Pattinson and Stewart slip into their roles with seamless precision. Pattinson portrays Edward perfectly, making his inner struggle known to the audience; often with no words at all. Stewart, in turn, is the perfect image of Bella: just as beautiful as she is unsure of herself and everything that she stands for. Their chemistry on-set makes the love they have for each other seem tangible, to point where it feels like the audience is intruding on their most treasured memories. Twilight, one of my favorite books for the last two years, has suddenly become one of my favorite movies as well. It's the perfect remedy for a broken heart, the kind of movie that makes you feel good even on the rainiest of days. The movie brings to life all the typical struggles of teen life, while simultaneously making you wish you lived in Forks after all. "The universe is not only queerer than we suppose; it is queerer than we can suppose." Twilight itself is great and all, except for Kristen Stewart.... Anyway, great review, I love it! i think the book was the best movies is nice as one gets to see the heart warming ROB PAT!! "You called down the thunder you got it. Tell 'em I'm coming and hell's coming with me!" I loved twilight. It was the movie i had ever seen. Which review is this? I want to read it! We're both ninjas. (= I have the feeling that if I knew you we would be friends. Are you an MLIAer? above comment at Ninja Writer. oops, forgot to press "reply". Technology fail. love all twilight movies and books!!!!!!!!!!!!! kristen stewart is the BEST!! "Which is worse, saying something and wishing you hadn't, or saying nothing and wishing you had?" You should really read the books. I guarantee you'll find something you like about it. Plus, after reading Twilight, you have to read New Moon which iis circulated around Taylor. Great review! Both the movie and the book were awesome! Twihards unite!! still havent seen any of the movies and wont die if i dont see them in my life!!!! but taylor lautner you are the cutest guy on the planet!!!!!!!!!!!!!!!!!!!!!!!!!!!!!!!!! I agree that Robert Pattinon was good in his role, but Kristen was much better in films where she has a grittier role. Her perforancei n the Runaways was unforgettable. The truth is that at some point, everyone's going to hurt you. You just have to decide who's worth the pain. Some say having something to lose is what makes you vulnerable. I believe that having something to lose only makes you stronger. I love your article - it's very well written and the words you use to convey your message flow together seamlessly. this is an awesome review!! !